Platelet rich plasma (PRP) utilizes part of the body’s natural inflammatory process to accelerate and enhance healing. PRP is an autologous blood derivative, which means it is a blood product from a specific pet and then administered back to that same individual. Benefits of treatment: Used for musculoskeletal pain and inflammation to reduce the intensity and duration of pain and to accelerate healing. Feel free to contact us for more details on how it works and the cost involved. 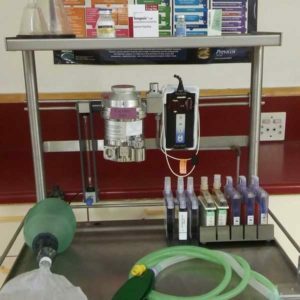 The Glens Veterinary Hospital has the most progressive and modern anaesthetic equipment available, including routine isofluorane gas maintenance (which is what most human hospitals use). In our fully equipped theatres, anaesthetic monitoring includes monitoring your pet’s heart rate, respiration rate and blood oxygen level on the relevant equipment. This allows our veterinarians to detect any anaesthetic abnormalities quickly so that proactive steps can be taken before a problem occurs. The Glens Veterinary Hospital utilizes comprehensive pain management protocols routinely on all surgical patients to ensure that intra-operative and post-operative discomfort is minimized. Our veterinarians recommend pre anaesthetic blood tests for all procedures requiring anaesthetics especially our geriatric or older pets and those animals that may be compromised for any medical reason. At The Glens veterinary Hospital we have an oxygen generator which can be used if any compromised patient needs pre- or post-surgical oxygenation. This is also extremely useful in emergency cases involving pets where increased oxygen is required. E.g. cases of shock or respiratory failure. The basis of good quality veterinary medicine and surgery is diagnosis. Once an accurate diagnosis has been made, the best treatment course for your pet becomes more obvious and successful. We have a purpose build theater where we can perform any procedure from minor growth removals to specialized intra-abdominal and orthopaedic surgeries. Our recovery ward allows us to closely monitor all our hospitalized patients until they are ready for discharge. 70% of our family pets over 3 years of age have evidence of dental disease. Early tartar formation can quickly progress to periodontal disease with erosion of tooth roots and the consequent loss of your dog or cat’s teeth. Perhaps the most important aspect of dental disease however is the absorption of the toxins and bacteria in the mouth due to dental disease into the rich network of blood vessels in the gums and hence the spread of these bacterial and toxins to the other organs in your dog or cats body. Dental disease is often responsible for the spreading of infections to other parts of your pets body e.g. airways, heart and especially the filtration organs of your animal e.g. the liver and kidneys. 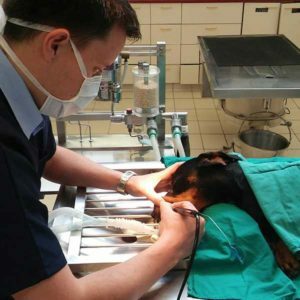 The Glens Veterinary Hospital has the necessary dental equipment to enable a thorough cleaning, descaling and polishing of your family pets’ teeth. Unfortunately, in spite of routine oral health care some of our animals still need regular dental work. Our state-of-the-art digital radiography equipment provides a much clearer image quality and makes correct diagnosis easier. Ultrasound or sonar is a minimally invasive modality which allows our veterinarians to visualise internal organs painlessly. 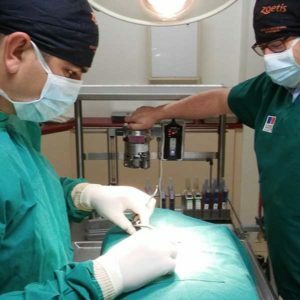 This is a procedure whereby the veterinarian uses a fibre optic flexible tube to directly visualize structures in your pet’s oesophagus, stomach, intestines or airways. 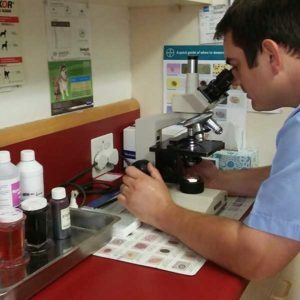 The Glens Veterinary Hospital has laboratory equipment to analyse various blood parameters such as kidney and liver function within 20-30 minutes ‘in house’. Many of the common infectious diseases that our pets are susceptible to such as feline AIDS, leukaemia virus, cat flu (parvo virus), Distemper and Ehrlichia can be tested for at The Glens Veterinary Hospital with results within 10 minutes. We are also able to do other routine tests such as checking for Tick Bite Fever, full urine analysis and faecal tests during your pet’s consultation. 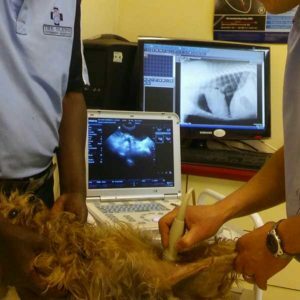 For any specialised test, not able to be done in-house, we make use of Vetdiagnostix and Idexx (2 veterinary laboratories in Gauteng) to ensure a comprehensive means of diagnosis in all cases, should it be necessary. 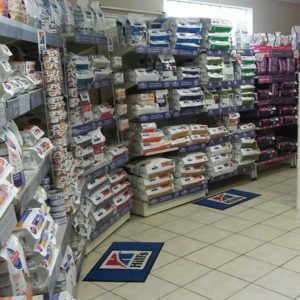 The Glens Veterinary Hospital stocks all the reputable premium quality dog and cat foods available in South Africa including Hills Science Diet, Eukanuba, Iams, Royal Canin (also breed specific foods), Acana, Orijen, Scientific Veterinary Diet and Vets Choice. Our receptionists, who receive continuous training about the contents and benefits of these premium quality pet foods, are available to help you choose the correct diet for your family pet. We stock a wide range of good quality tick and flea treatments .It is important to rotate products every 2-3 months to help prevent the build-up of resistance, and to use products at their correct doses and frequency. We stock leading brands like Bravecto, Nexgard, Frontline. Our receptionists are able to advise you on the best product for your individual needs. 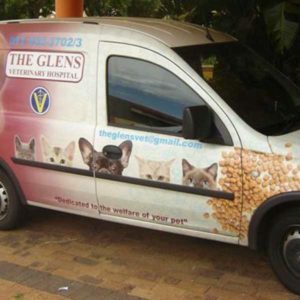 The Glens Veterinary Hospital does house visits for ‘at home’ pet vaccinations & euthanasia’s. We can also do basic consultations and for those pets that is in need of more extensive ‘work-up’s’ we offer an ambulance service. This service is strictly on an appointment basis and therefore may not be available in animal emergency situations, on weekends or at short notice. We do food deliveries in the surrounding areas on selected days of the weeks. Free deliveries for orders over R950. All other orders have a R50 delivery fee. Please contact reception for more details & to place your order today. We will gladly discuss the anticipated cost prior to the treatment of your pet. Fees are payable by cash, debit or credit card on the completion of consultation, or at discharge, or on termination of treatment. Unfortunately, we do not run accounts.